1. Zentralklinik Bad Berka GmbH, THERANOSTICS Center for Molecular Radiotherapy and Molecular Imaging (PET/CT), Robert-Koch-Allee 9, D-99437 Bad Berka, Germany. 2. ABX-CRO Forschungsgesellschaft m.b.H., Blasewitzer Strasse 78 - 80, D-01307 Dresden, Germany. Purpose: To characterise efficacy and safety of 177Lu-DOTATOC as agent for peptide receptor radiotherapy (PRRT) of advanced neuroendocrine tumours (NET). Patients and methods: Fifty-six subjects with metastasized and progressive NET (50% gastroenteral, 26.8% pancreatic, 23.2% other primary sites) treated consecutively with 177Lu-DOTATOC were analysed retrospectively. Subjects were administered 177Lu-DOTATOC (mean 2.1 cycles; range 1-4) as 7.0GBq (median) doses at three-monthly intervals. Efficacy was analysed using CT and/or MRI according to RECIST 1.1 criteria and results were stratified for the number of administered cycles and the primary tumour origin. Results: In the total NET population (A), median progression-free (PFS) and overall survival (OS) were 17.4 and 34.2 months, respectively, assessed in a follow-up time (mean ± SD) of 16.1 ± 12.4 months. In patients receiving more than one cycle, mean follow-up time was 22.4 ± 11.0 months for all NETs (B) and PFS was 32.0 months for all NETs (B), 34.5 months for GEP-NET (C), and 11.9 months for other NETs (D). Objective response rates (Complete/Partial Responses) were 33.9%, 40.6%, 54.2%, and 0% for A, B, C, and D groups, respectively, while disease control rates in the same were 66.1%, 93.8%, 100%, and 75%. Complete responses (16.1%, 18.8% and 25.0% for groups A, B and C) were high, 78% of which were maintained throughout the follow up. There were no serious adverse events. One case of self-limiting grade 3 myelotoxicity was reported. Although 20% of patients had mild renal insufficiency at baseline, there was no evidence of exacerbated or de novo renal toxicity after treatment. Conclusion: 177Lu-DOTATOC is a novel agent for PRRT with major potential to induce objective tumour responses and sustained disease control in progressive neuroendocrine tumours, even when administered in moderate activities. The observed safety profile suggests a particularly favourable therapeutic index, including in patients with impaired bone marrow or renal function, which reflects a uniquely low uptake of 177Lu-DOTATOC by normal organs. Keywords: Neuroendocrine tumour, somatostatin receptor, peptide receptor, radiotherapy, radionuclide therapy, somatostatin analogue. Expression of somatostatin receptors of various sub-types is common in differentiated metastasized neuroendocrine tumours (NET) , rendering them amenable to peptide receptor radiotherapy (PRRT) with radiolabelled somatostatin analogues (SSA). 90Y-DOTATOC was the first PRRT agent to be systematically investigated in clinical studies . The latter was shown to increase overall survival but it was associated with significant transient myelotoxicity and permanent renal toxicity, despite concomitant infusion of nephroprotective amino acid solutions . This has triggered the investigation of lutetium-177 (177Lu) as alternative radionuclide for PRRT, for its more favourable path length of 1.6mm (in tissue) compared to 11mm for 90Y, rendering it potentially less nephrotoxic. To date, the most extensively studied 177Lu-labelled somatostatin analogue is [177Lu-DOTA0,Tyr3]-octreotate (177Lu-DOTATATE) . PRRT with 177Lu-DOTATOC was first described by Forrer in patients with relapsed NET . A subsequent retrospective study found 177Lu-DOTATOC to be significantly less myelotoxic than 90Y-DOTATOC, and to induce a significantly longer overall survival when low tumour uptake, extra-hepatic disease or solitary metastases were present . Attempts to compare therapeutic potential and safety profile of different 177Lu-labelled somatostatin analogues have produced conflicting results. The in vitro affinity profiles of various somatostatin radio-ligands with and without radio-metals were initially characterized by Reubi , using cell lines stably expressing the human somatostatin receptor subtypes sst1-sst5. The affinity (IC50) of un-complexed DOTATATE for sst2, the most widely expressed subtype in NET, was found to be nearly 10 times higher, relative to DOTATOC (1.5 ± 0.4 nM vs. 14 ± 2.6 nM). While binding of 90Y essentially does not change affinity, complexation of other radiometals may considerably modify affinity characteristics. For instance, gallium leads to a more than five-fold increase in affinity (0.2 ± 0.04 nM vs. 2.5 ± 0.5 nM) compared to the un-complexed ligands in vitro . To date, the impact of lutetium complexation on sst2 affinity of DOTATOC and DOTATATE has not been reported. Yet, most retrospective   and prospective , ,  clinical studies on PRRT efficacy in metastasized NET have been performed with 177Lu-DOTATATE. In an attempt to characterize PRRT with 177Lu-DOTATATE compared to 177Lu-DOTATOC in humans, tumour uptake, biodistribution and dosimetry have been extensively studied. Esser  determined tumour, kidney and spleen residence times of both agents in seven subjects. Treatments were given in a crossover design. Residence time ratios (TATE/TOC) of 2.1 for tumour, and 1.4 for kidneys were determined, from which a 1.5 factor (tumour/kidney) in favour of 177Lu-DOTATATE was observed. Kulkarni  analysed absorbed doses (mGy/MBq) to tumour and kidneys in 22 NET patients, who underwent 177Lu-DOTATATE treatment followed by a 177Lu-DOTATOC cycle 12 ± 2 months apart. In 53% of 43 individual lesions, tumour-to-kidney ratios of absorbed doses were higher for 177Lu-DOTATOC. In the largest investigation to date, Schuchardt  compared absorbed doses (mGy/MBq) to whole body, kidneys, spleen, and tumour lesions in a parallel group setting. Patients who were PRRT-naïve (N=253), underwent first PRRT with either 177Lu-DOTATOC (N=59), or 177Lu-DOTATATE (N=185), or 177Lu-DOTANOC (N=9). Median absorbed doses to whole body, kidneys and spleen were significantly lower for 177Lu-DOTATOC (0.03, 0.6 and 0.7 mGy/MBq), compared to 177Lu-DOTATATE (0.05, 0.8 and 1.1 mGy/MBq) and 177Lu-DOTANOC (0.07, 1.1 and 1.3m Gy/MBq), while median absorbed doses to tumour lesions were comparable for the first two (4.9 vs. 5.2 mGy/MBq, n.s. ), but significantly lower for 177Lu-DOTANOC (2.0 mGy/MBq). In contrast to the conclusion of Esser , the authors of this largest comparative study to date  concluded that 177Lu-DOTATOC delivers the lowest dose to normal organs and the highest tumour-to-kidney ratio of the three peptides. While methods and conclusions of these studies differ, they all report a similar and significantly lower kidney uptake for 177Lu-DOTATOC, relative to other peptides , , . Most intriguing were the results of tumour uptake of 68Ga-DOTATOC and 68Ga-DOTATATE in a PET/CT study of 40 NET patients imaged twice within a fortnight, using either tracer in a comparable mass dose (6 ± 3 µg) . Unexpectedly, 68Ga-DOTATOC imaging detected more diseased regions (79 vs. 78; n.s. ), more lesions (262 vs. 254; p < 0.05) with a higher mean SUVmax (20.4 ± 14.7 vs. 16.0 ± 10.8; p < 0.01), indicating a significantly higher tumour uptake in vivo compared to 68Ga-DOTATATE. In view of a tenfold higher sst2 affinity of 68Ga-DOTATATE found in vitro , the authors conclude that the reported differences, measured in transfected cells in vitro, do not seem to be clinically relevant. The emerging evidence, that 177Lu-DOTATOC has a particularly favourable therapeutic index compared to other PRRT agents in clinical use, prompted us to further characterize efficacy and safety of this compound. In a phase II treatment protocol, a comprehensive panel of oncological efficacy endpoints were evaluated, including progression-free survival (PFS), overall survival (OS), objective response rate (ORR), disease control rate (DCR), duration of disease control (DDC), as well as safety parameters with emphasis on renal and bone marrow toxicity. All patients were referred to the Zentralklinik Bad Berka, Germany (ZBB) with a diagnosis of progressive NET. Written informed consent was obtained and included the use of data for future research, storage, and transfer for analysis. The competent Ethics Committee (Medical Council of Thuringia, Germany) approved the study. Between 2009 and 2013, the ZBB recorded 140 patients with low- and intermediate-grade metastatic NET and progressive disease who started PRRT with 177Lu-DOTATOC. Progressive disease was confirmed within 6 months before the start of PRRT on morphological CT or MRI scans according to RECIST 1.1 criteria , or as new lesions on 68Ga-DOTATOC PET/CT images, which were obtained from all patients to establish the presence of DOTATOC uptake-positive tumours. Patients were treated consecutively without any further prior selection and inclusion in the study was determined by peptide availability. Of those 140 patients, 64 patients, who constituted the study population, did not receive other PRRT agents than 177Lu-DOTATOC until progression. Furthermore, all other anti-neoplastic medication was withheld, long-acting somatostatin analogues at least 4-6 weeks before the start of PRRT. Follow-up data were available from 56 patients for analysis of outcome. Follow-up time (mean ± SD) was 16.1 ± 12.4 months for all 56 NET patients, and for those, receiving more than one PPRT treatment 22.4 ± 11.0 months. Data were anonymised prior to being processed. The primary tumours were of gastro-enteral (50%), pancreatic (26.8%), or other origin (bronchopulmonary 8.9%, unknown (CUP) 5.4%, thymic 3.6%, renal, ovarian, or Meckel´s diverticulum, 1.7% each). Detailed demographic characteristics are provided in Table 1. 177Lu-DOTATOC was prepared on site as previously described , resulting in a specific activity of 1 GBq/20 µg DOTATOC, using carrier-free lutetium-177 (ITG, Garching, Germany) and DOTATOC (Bachem, Bubendorf, Switzerland). 177Lu-DOTATOC was administered as slow intravenous infusion over 15 minutes. To prevent radiation-induced nephrotoxicity, 1500 ml of a nephroprotective L-lysine and L-arginine solution were co-infused with 177Lu-DOTATOC, as previously described , starting 30 min prior to the radiopharmaceutical and continued for 4h thereafter, according to current guidelines . 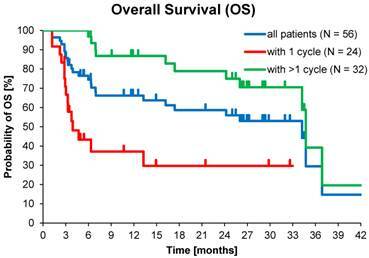 The number of 177Lu-DOTATOC cycles was one in 43%, two in 30%, three in 21%, and four in 6% of patients. The median administered activity per cycle was 7.0 GBq (range 3.5 - 10.0). The maximum cumulative administered activity was 29.2 GBq. Median intervals (Q25 - Q75) between cycles were 3.01 (1.84 - 3.48), 3.02 (2.30 - 4.14) and 4.24 (3.91 - 14.94) months, for the first, second and third intervals, respectively. Treatment response and diagnosis of progression were evaluated using CT and/or MRI images depending on modality used at baseline, according to RECIST 1.1 criteria . Imaging was performed prior to each PRRT cycle and at restaging. Restaging took place every 7 ± 3 months (mean ± SD) after the last PRRT cycle. Haematology (erythrocytes, haemoglobin, platelets, leucocytes lymphocytes, neutrophils) and laboratory parameters (serotonin, chromogranin A, creatinine, BUN, K+, bleeding time (Quick), SGOT, SGPT, bilirubin, SAP, TSH, SGamma-GT) were evaluated prior to each cycle and at restaging. 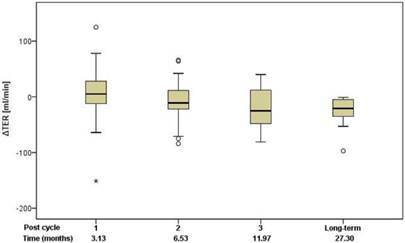 Renal function was further evaluated by tubular extraction rate (TER) using 99mTc-MAG3 renography. In addition, in a subset of patients (N=32) the glomerular filtration rate (GFR) was determined using 99mTc-DTPA renography. Efficacy analysis was performed for all NET, GEP-NET (gastro-entero-pancreatic), and other NET. Each efficacy cohort was subdivided in groups having received any, 1 or >1 PRRT cycles. As this was a treatment protocol without a control group, all variables were analysed descriptively and included for continuous variables: means, standard deviation, medians and ranges, and 95% confidence intervals. For discrete (ordinal) variables medians, ranges and frequency distribution were used, while for nominal variables frequency distribution was used. Kaplan-Meier analysis was used for PFS, OS and DDC. For statistical analysis IBM SPSS version 20.0.0 software, was used. At the time of database lock, 24 patients (42.9 %) of the study population had undergone only a single 177Lu-DOTATOC cycle. Of these, 15 died from progressive disease prior to further PRRT. In four patients, treatment was discontinued or halted after induction of a complete or partial response. In five patients no further follow-up data were available. To allow for better comparison with published studies on 177Lu-DOTATATE monotherapy (Table 2), which all included only patients able to undergo ≥ 4 cycles, patients were stratified for the number of 177Lu-DOTATOC cycles received (1 vs. >1). The average number of cycles in the group of patients having received >1 cycle amounted to 2.6 ± 0.8. Patients treated only once were found to have a significantly lower Karnofsky performance status (KPS) at baseline (70.4 vs. 89.4, p < 0.001), indicating a very advanced disease stage (Table 3) as also reflected by the high mortality rate in this group. Median PFS was 17.4 months in the total population (N=56), and 32.0 months in patients with >1 177Lu-DOTATOC cycle, compared to 3.8 months after a single cycle. For the GEP-NET subgroup, the corresponding values were 30.3, 34.5 and 4.7 months, respectively. PFS in patients with NETs of other origins (lung, CUP, thymus, kidney, ovary, Meckel´s diverticulum) was considerably lower (Table 4). At database lock (May 2014), 46% (N=26) of patients had died. Median OS was 3.9 months for patients who received one cycle of 177Lu-DOTATOC in contrast to 34.7 months for patients who received >1 cycle. Median OS for GEP-NET patients who received >1 cycle was also 34.7 months, while for patients with NET of other origins who received >1 cycle OS was 16.2 months (Table 5). Objective Response Rate (ORR), defined as proportion of patients achieving partial (PR) or complete response (CR), per RECIST 1.1 criteria  was 33.9% (19 of 56) in the total population. In all patients who received >1 cycle ORR was 40.6% (13 of 32), while for GEP-NET patients with >1 cycle it was 54% (13 of 24), and complete remission was recorded in 16.1%, 18.8%, and 25.0%, respectively. Disease Control Rate (DCR, encompassing CR, PR and SD) was achieved in 66.1% (37 of 56) of all treated patients and in 93.8% (30 of 32) patients who received >1 cycle, and in all (100%) GEP-NET patients with >1 cycle (Table 6). 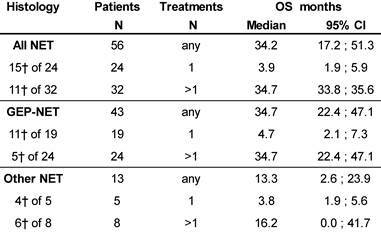 For comparison, Table 6 also shows the best overall response of all patients with a baseline KPS ≥ 60, irrespective of the number of treatment cycles. Duration of Disease Control (DDC; defined as time from achieving SD or better until progression or death from any cause) in the study population was 28 months (95% CI: 22.2-33.8), despite 22 of 37 patients' data being censored due to the absence of progression. Previous PRRT monotherapy studies in mNET. BL SD - Percent Patients with Stable Disease at Baseline. Karnofsky performance status at baseline, stratified for number of PRRT. 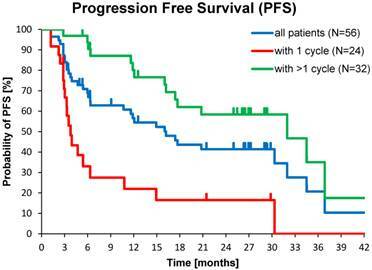 Kaplan-Meier estimates of Progression Free Survival stratified for NET origin and number of PRRT cycles. Kaplan-Meier estimates of Overall Survival stratified for NET origin and number of PRRT cycles. ┼ number of patients died. Best overall response (acc. to RECIST) after at least 1 PRRT. Kaplan-Meier estimates of OS in the study population depending on number of 177Lu-DOTATOC PRRT cycles. Latency between first PRRT cycle and response varied considerably, which motivated further characterisation of response time. An initial response (SD or better) was observed in 68% (25 of 37) of patients within 4 months, while for the remaining patients (32%) it was four to eight months from first PRRT (Figure 3). Four patients (11%) required two, and one patient (2.7%) three 177Lu-DOTATOC cycles for induction of a response. The best response was first observed in 76 % of patients (28 of 37) within 8 months from first PRRT, while in 24% of patients the latency was greater, going up to more than 22 months (Figure 3). Interestingly, nearly half (9 of 19) of all objective responses (PR, CR) took more than eight months to develop from start of treatment. In 26% (5 of 19) objective responses developed from prior stable disease 12 - 20 months after the last PRRT cycle without further antineoplastic treatment (late responders). Of the total population, 54% (30 of 56) had received prior medical therapy, mostly somatostatin analogues and to a lesser extent chemotherapy, while 46% of subjects had undergone only loco-regional therapies or surgery. This allowed comparisons between medically naïve patients and second-line treatments. Median PFS in patients who received >1 cycle without prior medical therapy (15 of 32) was 34.5 months (95% CI: 10.6 - 58.4) compared to 20.8 months (95% CI: 3.9 - 37.7) for those with prior medical therapy (17 of 32), p=0.06 (Figure 4). The ORR in patients with baseline KPS of 100, 90, 80, and ≤70, was 67%, 35%, 20% and 14%, respectively, and DCR was 83%, 95%, 50%, and 21%, respectively. When followed up over several cycles, KPS values did not change significantly. Likewise, No changes in serotonin and chromogranin A levels, nor a correlation between these parameters and cumulative administered radioactivity was observed. Treatment with 177Lu-DOTATOC was very well tolerated. No serious adverse events were observed. A total of 83 adverse events were reported in 61% of patients (34 of 56), the majority (>60%) having been gastrointestinal and general disorders, or events at the administration site. All recorded adverse events with causal relationship to 177Lu-DOTATOC treatment were of mild to moderate intensity and resolved spontaneously. At baseline, haemoglobin was normal in 59% of subjects, while 32% had grade 1, and 9% ≥ grade 2 anaemia. Following treatment, 21% of the previously normohaemic patients developed grade 1 anaemia. Of those with baseline anaemia, 11% developed grade 2, and one subject developed grade 3 anaemia, which recovered spontaneously. Erythrocyte numbers showed a tendency to decline with the number of cycles and were weakly correlated with the cumulative administered activity. A similar correlation was observed for serum liver enzyme levels (SGOT, SGPT, SAP) and alkaline phosphatase but not for haemoglobin, platelets, leucocytes, lymphocytes, or neutrophils. Otherwise, no other laboratory parameters showed any significant change or trend relative to baseline. 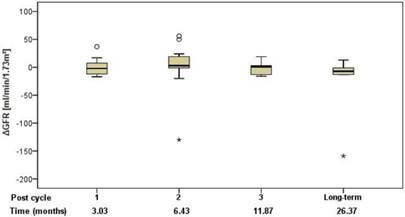 Renal function was assessed using standard clinical parameters (creatinine, K+ and urea - BUN), none of which showed any changes from baseline, relative to number of cycles or to cumulative administered radioactivity. Tubular extraction rate (TER), determined by 99mTc-MAG-3 renography, was used to capture more subtle dysfunctions of proximal renal tubules . Neither TER nor the departure of TER from baseline (ΔTER) showed any correlation with the number of cycles and median time after the first 177Lu-DOTATOC PRRT cycle (Figure 5) or cumulative activity received. In 32 patients (57%), glomerular filtration rate (GFR) was measured using 99mTc-DTPA at baseline and at approximately 3, 6, 12, and 24 months after first PRRT. For follow-up values, departure from baseline (ΔGFR) was determined. Neither GFR nor ΔGFR showed any correlation with the number of cycles and median time after the first 177Lu-DOTATOC PRRT cycle (Figure 6) or cumulative activity received, despite the GFR cohort including 34.4% subjects with grade 2 renal impairment at baseline (GFR 35 - 60 ml/min/1.73 m2). 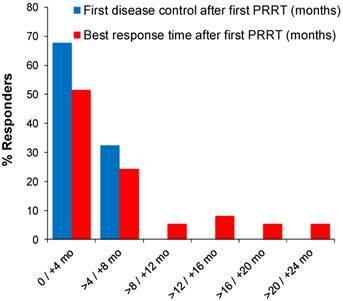 Time of first disease control and best response after start of PRRT in 37 responding patients. 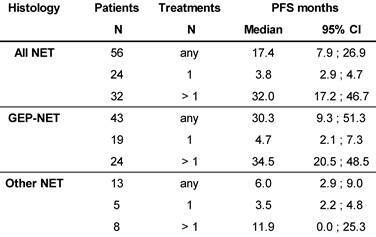 Kaplan-Meier estimates of PFS in patients who received >1 cycle with or without prior medical therapy. Change of TER relative to baseline in relation to the median time after the first 177Lu-DOTATOC PRRT cycle. Change of GFR relative to baseline in relation to the median time after the first 177Lu-DOTATOC PRRT cycle. We report on the most detailed analysis of efficacy and safety of 177Lu-DOTATOC as PRRT agent for treatment of metastasised neuroendocrine tumours (NET). 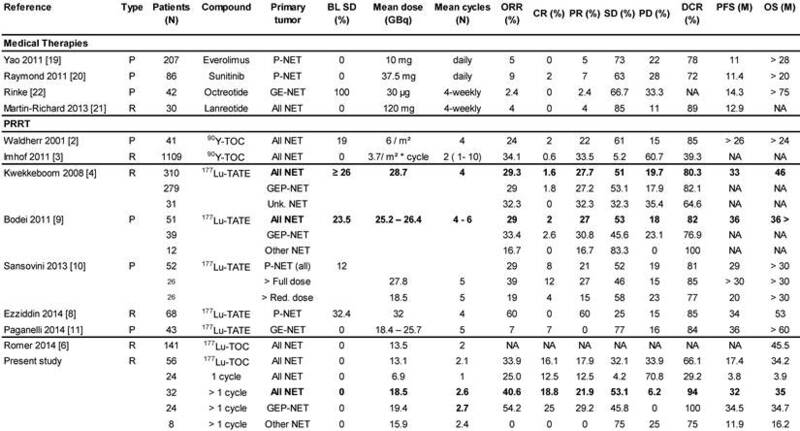 Although as many as 43% of our patients underwent only one 177Lu-DOTATOC cycle, the median PFS (17.4 months; 95% CI: 7.9 - 26.9) observed in our study compares very favourably to what is reported for everolimus (11.0 months) , sunitinib (11.4 months)  or lanreotide (12.9 months) , in pre-treated, and for octreotide (14.4 months)  in drug naïve NET patients. Considering that natural history alone accounts for 5 - 6 months' PFS in patients with progressive NET, as consistently reported from placebo-controlled trials , , , the efficacy advantage of 177Lu-DOTATOC, compared to currently approved NET treatments, is likely greater than the PFS results suggest. 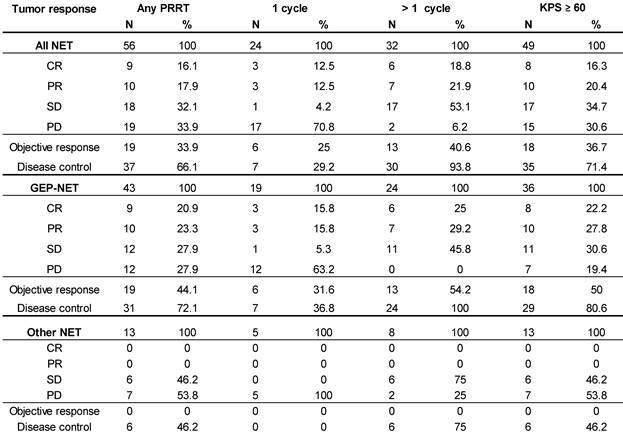 Indeed, when focusing on patients who received >1 PRRT cycle, in line with current guidelines , the observed median PFS of 32.0 months (95% CI: 17.2 - 46.7) is among the highest so far reported for any PRRT agent (Table 2), taking into consideration that all our patients had disease progression at baseline, and that 23% of them had NETs with primaries from lung (9%), thymus (4%), unknown (5%) or atypical origin (5%), with a considerably poorer PFS (11.9 months; 95% CI: 0.0 - 25.3), in line with previous reports , . For comparison, Kwekkeboom , in the largest study on 177Lu-octreotate to date, reported a PFS of 33 months in a population of 310 GEP-NET patients. In this study patients were treated with a cumulative activity of 27.8 - 29.6 GBq in four cycles, but more than 25% of these patients were not in progression at baseline. In contrast, all GEP-NET patients reported here had progressive disease and those who received >1 PRRT cycle, had on average a substantially lower 177Lu-activity (19.4 ± 5.4 GBq), administered in fewer cycles (2.7 ± 0.8) which induced a PFS of 34.5 months (95% CI: 20.5 - 48.5). For a similar activity difference (27.8 vs. 18.5 GBq) in metastatic P-NET patients treated with 177Lu-octreotate, Sansovini  reported a PFS difference greater than 10 months (p = 0.05) in favour of the higher activity. These observations are likely to reflect a considerable efficacy difference in favour of 177Lu-DOTATOC, in keeping with a higher and more widespread tumour uptake reported for 68Ga-DOTATOC, compared to 68Ga-DOTATATE . This interpretation is further supported by the objective responses we have found in our study. For all NETs undergoing >1 PRRT cycle, we observed CR, PR and SD in 18.8%, 21.9% and 53.1% of patients, respectively, compared to 1.6%, 27.7%, and 51.0% found by Kwekkeboom , and similarly 2%, 27% and 53% reported by Bodei  for 177Lu-octreotate in comparable patients. With only 6.2% non-responders, the overall DCR was 94%, compared to 80-85% reported for 177Lu-octreotate , , , ,  (Table 2). This difference in DCR between the peptides is accounted for by a ten-fold higher rate of patients experiencing CR following 177Lu-DOTATOC. In the subgroup of patients with GEP-NET undergoing >1 PPRT cycles, the proportion of complete responders was 25%, which is the highest value reported in this condition to date, compared to an average of 5% (range 0-12%), reported for 177Lu-octreotate , , , , . One could argue that selecting patients treated with > 1 cycle for comparison with other studies introduces a bias. However, as alluded to before, all other monotherapy studies with177Lu-DOTATATE have included only patients who were able to undergo ≥ 4 cycles on average, introducing at least a similar or even more severe bias. 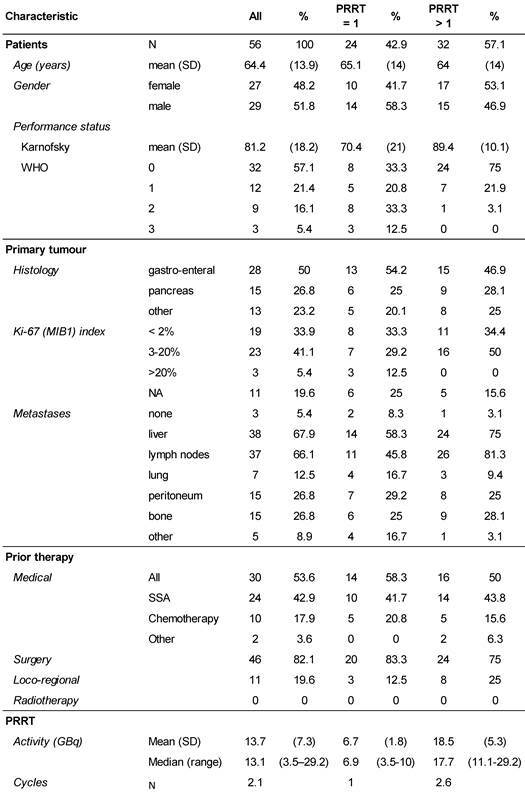 Nevertheless, since in other studies cut-off values for KPS have been used as inclusion criterion , ,  we have also included in Table 2 on the best overall response a subgroup analysis of all patients with a KPS ≥ 60, demonstrating that results on ORR and DCR in this subgroup are also very good and hence any bias introduced by selecting patients with > 1 cycle is limited. Furthermore, since CR was also observed in 12.5 % of subjects treated only once, it is unlikely that the apparent higher efficacy of 177Lu-DOTATOC is an artefact as the absolute number of subjects with CR (N=9) is higher than reported from any other PRRT study (Table 2). Median PFS and OS were significantly better for patients treated with >1 PRRT (32.0 vs. 3.8 and 34.7 vs. 3.9 months). However, also in patients who experienced disease control from a single 177Lu-DOTATOC cycle (29.2 %), individual PFS of up to 30 months and individual OS of up to 33 months were observed (data not shown), confirming that induction of disease control is directly correlated with survival after PRRT, as previously reported . 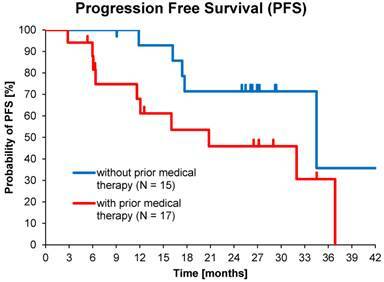 For patients' naïve to systemic treatment, PFS was considerably longer than for patients undergoing PRRT with 177Lu-DOTATOC as second-line treatment (34.5 vs. 20.8 months), 80% of whom had previous progression after somatostatin analogues (SSA). While it remains unclear whether this difference reflects merely a longer time from diagnosis or a selection of tumour clones with reduced affinity for SSA in these patients, the data strongly suggest, that the individual benefit from 177Lu-DOTATOC may be the highest, if used early in the disease. The analysis of the time pattern, with which morphological response develops after 177Lu-DOTATOC revealed several aspects we consider relevant to the practise of PRRT: (i) 14% of patients required more than one cycle to induce an initial response (SD or better), when PD was present at baseline, (ii) in 32% of responders, it took between four to eight months from first PRRT before an initial response could be detected, (iii) upon initial response, morphological outcome may further improve for up to 20 months after last PRRT without further antineoplastic treatment (late responders), and (iv) in 47% of subjects the development of an objective response (PR, CR) took more than 8 months from the first cycle. Conceptually, PRRT is fractionated, targeted radiotherapy. In contrast to external beam radiotherapy (EBRT), PRRT administration frequently follows individualized regimens, guided by response assessments, typically based on imaging information from first re-staging (at 2 - 4 months, immediately before the second cycle). Considering the pattern of response to PRRT reported here, imaging information from first re-staging was not adequate to assess or predict efficacy in nearly a third of patients who required either more cycles, more time, or both to achieve stable disease or better. Therefore, to minimize the risk of prematurely discontinuing a potentially effective therapy, efficacy should be definitively established after completion of PRRT, rather than during PRRT, as established in EBRT. Considering the observed response pattern, the earliest time point to correctly establish efficacy of 177Lu-DOTATOC was at about eight months after first PRRT. Acute grade 3 myelotoxicity occurring in one patient was the most severe adverse event observed, although 41% of subjects had anaemia at baseline. No significant impact on white blood cells or platelets was observed. Similarly, a comprehensive screen for renal toxicity did not indicate a hazard to the kidneys during PRRT with 177Lu-DOTATOC, nor for a period of more than 24 months thereafter. Quite unexpectedly, a weak, but significant correlation of SGOT, SGPT and SAP with administered activity was found. Since 68% of our patients had liver metastases, we cannot exclude minor liver damage related to PRRT. More likely, however, is that these correlations may indicate persistent or anew growth of hepatic metastases causing this rise of enzymes. In conclusion, 177Lu-DOTATOC seems highly promising for PRRT of patients with metastasised, well-differentiated NET. Efficacy was found to be highest when 177Lu-DOTATOC was administered in repeated cycles. In progressive low- and intermediate-grade GEP-NET patients, a PFS of 34.5 months and a high tumour control rate (objective response 54.2%, stable disease 45.8%) indicate that 177Lu-DOTATOC may provide a substantially higher benefit than any other current treatment for NET. Importantly, no evidence of clinically relevant bone marrow suppression was observed. Using appropriate nephroprotective co-medication, radiation-induced kidney toxicity was not detected, not even in the presence of mild renal failure at baseline. Finally, the retrospective nature of the present study and its limited sample size in the light of the highly promising results warrant a prospective Phase III trial of PRRT with 177Lu-DOTATOC in NET patients to confirm or refute our evaluations. Corresponding author: Prof. Dr. Cees J.A. van Echteld, ABX-CRO Forschungsgesellschaft m.b.H. Blasewitzer Strasse 78 - 80, D-01307 Dresden, Germany. Phone: +49 / 351 21444-275 Fax: +49 / 351 21444-15 E-mail: vanechteldcom.